For some travellers Coober Pedy is just an ugly, dusty place in the middle of nowhere. 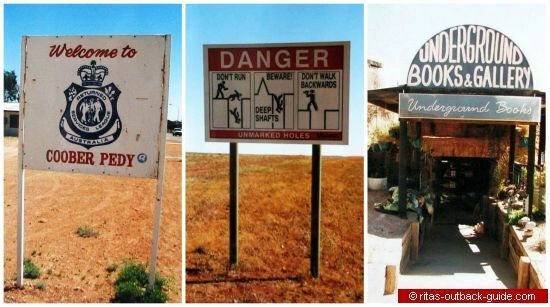 However, many visitors are fascinated by this unique opal mining town in Outback South Australia. Where you can dig a hole and live and die without a trace." Now I don't want that you disappear without a trace, so be careful and don't stumble into one of the mining shafts. Coober Pedy and the opal mining fields lie on a stony desert plain on the edge of the Stuart Ranges, approximately 845 km north of Adelaide. If you drive into town from Oodnadatta, you cross the moon plain which has been the set for several movies. It's the most desolate, featureless place I have ever seen. You can't get more Australian Outback than that! 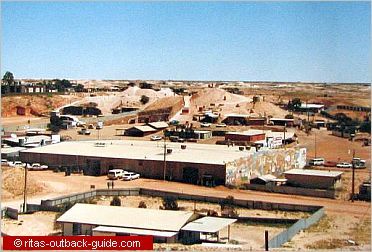 Coober Pedy is an Aboriginal name that means "white men in a hole". The name perfectly describes the fact that about 80 % of the residents live underground to escape from the heat in summer, and the cold nights in winter. In 1915 opal was discovered by 14 year old Willie Hutchison who was a member of a gold prospecting party. After World War I many former soldiers came to the opal fields. It is said that they introduced the dugouts and living underground. Since then, adventurers from all around the world were attracted to seek their fortune in the opal mines, making the town a multicultural place of about 45 different nationalities. Today the opal fields produce most of the world's white opal. April to October (mild days, cold nights) is the recommended travel season. Summer is usually too hot (up to 45°C in the shade) to enjoy any activities. The little rain can fall any time around the year. 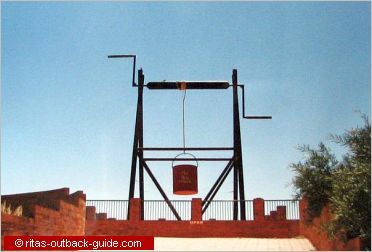 The Big Winch Scenic Lookout is one of the most prominent landmarks in town. The view over the pockmarked surroundings gives you an understanding about the opal mining activities. There is an opal shop next to the winch which has fossilised shells of opal embedded in its wall. The Scenic Lookout is the best place in town to watch the sunset across the desert. The Old Timers Mine, Crowders Gully Road, is an original opal mine dating back to 1916. It is a window through time. Nobody knows why the old time miners had back-filled the shafts, and never returned to the mine. The hidden mine was discovered in 1968 when an underground home extension broke through and revealed the wealthy mine. The opal is still to bee seen for visitors. 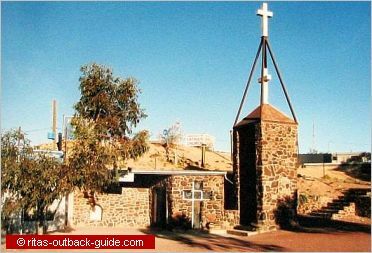 Saint Peter & Paul's Catholic Church - This was the first underground church in Coober Pedy, and probably the first in the world. In the early days the church was used by all denominations. It was built with the help of everyone in the community. Today the town has also an Anglican and a Serbian Orthodox church, both underground. 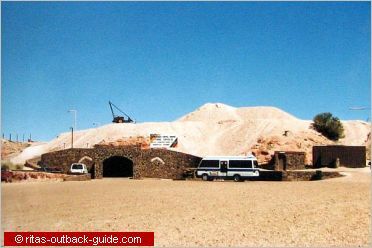 The Umoona Opal Mine & Museum is one of the top tourist attractions. Take a guided tour and see how they cut and polish the stone. Learn about the history in the interpretive centre, explore an underground home. The shop offers opal stones and jewellery for any price bracket, your chance to get an unique Australian opal as a souvenir. There is much more to see and explore in Coober Pedy. Walk along Hutchison Street, named after the boy who found the first opal, and you'll discover more unique buildings, shops and cafes. But make sure that you go somewhere underground, even if it is only for a drink, or to browse for a souvenir. It will enhance your experience. Drive around town and see hundreds of mole hills. But be careful! Always watch your step, and don't fall into a shaft. And please don't intrude on private property. All these hills of debris and the shafts belong to someone. Stay on designated paths. Want to try your luck? Fossicking, or noodling is allowed in an area called the "Jewell Box" at the eastern edge of town. Get yourself a pick and shovel, and dig in the piles of debris from the mines. If you're lucky, you might find a precious piece of Australian opal! Enjoy this fascinating Australian Outback experience. You can reach Coober Pedy on the sealed Stuart Highway. Coming from Alice Springs (690 km), or even Darwin (2210 km), in the north, or from Port Augusta (535 km) and Adelaide (845 km) in the south, either way it is a long drive. 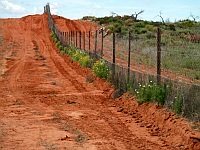 Want to do some Outback tracks while you are in this part of the world? No problem. There are two routes from Coober Pedy to join the famous Oodnadatta Track. It's about 165 km to William Creek on a track that crosses the world's largest cattle station, Anna Creek. Another option is to go from Coober Pedy to Oodnadatta via Mt. Barry, 195 km. Both tracks are rather lonely, and only suitable in dry weather conditions. I also recommend a trip to the Painted Desert and the Arckaringa Hills. Take the track to Oodnadatta for the first 143 km, and then turn left towards Arckaringa and Cadney homestead on the Stuart Highway. This is a nice detour from the highway, to see stunning Outback scenery, when you are travelling north from the Australian opal capital. Click on the image to get the road atlas or map for your trip! After all these activities, are you're looking for a place to relax? Now you really have the choice to "live like a miner" - that means underground! The locals know how to live convenient in this parched land, and they offer this unusual experience to their visitors as well. Hey, you can even camp underground in the opal capital of the world. 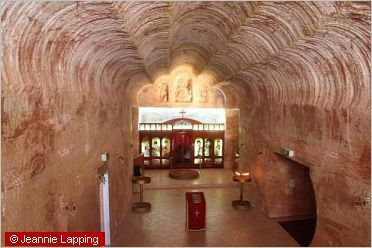 No worries, if the thought of staying in a "cave" doesn't appeal to you, Coober Pedy also offers you a bed in a place above the ground. Use the search box below to check for the best rates and see what is available. 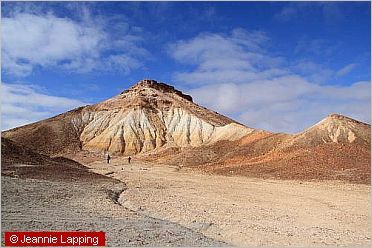 It is definitely worth to discover the surroundings of Coober Pedy. The colourful Breakaways are only a short drive to the north, while the dog fence and the desolate Moon Plain are located east of the town.